Kansas is up a creek financially. On Monday, the state's legislature will take on the daunting task of trying to find hundreds of millions of dollars to balance the state's budget, which is facing a shortfall of $280 million for this fiscal year. A big reason for the predicament, experts say: Some of the largest tax cuts in the state's history, signed into law in 2012 by Governor Sam Brownback. One of the biggest cuts: The profits of small businesses and partnerships were made tax-exempt. Tax policy experts like Joseph Henchman of the Tax Foundation suspect this change is a key reason for the state's unexpectedly large revenue shortfall. One concern is that other companies not eligible for the 0% tax rate may be trying to reorganize themselves so they, too, get the tax break. The tax-cut package was supposed to boost the Kansas economy and small businesses. Problem is, that hasn't happened. At least not yet, although the effects of tax cuts can take years to materialize. Tax experts lament that the cuts were poorly structured. "The goals behind them aren't bad. But the cuts weren't properly targeted," said Lori McMillan, a law professor at Washburn University in Topeka, Kansas. For instance, she noted, the tax-free profits measure is a boon for plenty of entities -- such as partnerships and S Corps -- that are not really small businesses at all. And the tax-free break on profits is not tied to the numbers of jobs those entities create. At the very least, lawmakers could have capped the amount of profits that are treated as tax-free, McMillan said. So, now what? Unlike the federal government, most states - including Kansas - are not legally allowed to run deficits. 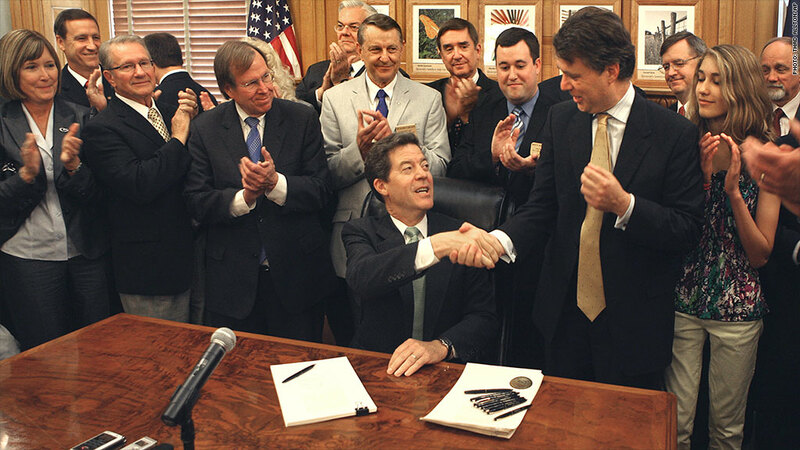 To dig the Sunflower State out of its hole, Brownback and the Republican-led Kansas legislature have to act fast. Critics of the tax cuts have been calling on lawmakers to reverse at least some of them. But even if that happened, it likely won't help with this year's shortfall. One of Brownback's proposals for cutting this year's shortfall is to reduce the state's contributions to the public employee pension fund for the next six months, a controversial move especially considering that the state pension plan is already underfunded. The governor doesn't need the legislature's approval to temporarily reduce pension funding, but he will for his other big idea, which is to use $201 million in funds from other state programs, such as the state highway fund and its health and environment fund. Even if lawmakers agree to it, the fund transfers are one-time fixes that can't be used again next year, when the state's budget shortfall will be much steeper -- as much as $648 million. On top of that, lawmakers will have yet another worry to add to their list. A district court ruled last month that the state has been underfunding its K-12 education system. The state might appeal the ruling. But if it sticks, that means the legislature will have to pony up what some estimate could be an additional $500 million or more a year for school funding. While Kansas deals with its budget problems, and assesses whether to keep or curb some of its tax cuts, other states will be interested in the outcome. "It's a great test case for the country," said Cara Griffith, editor in chief of news at the publisher Tax Analysts. "If I was a governor, I'd be watching very closely. Maybe the [tax-cut] package as a whole will fail, but maybe pieces of it will work."